One of the most annoying parts of my beauty routine is washing my hair. It's a daily task and with an oily scalp and dry ends, it's always been difficult finding the right balance of products. 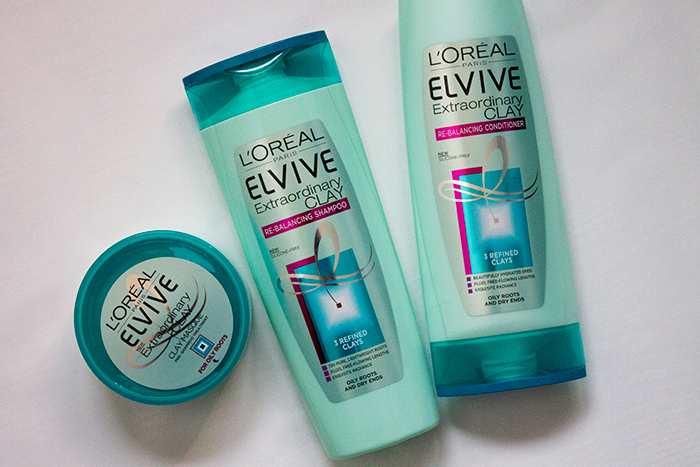 I've always been a big fan of the L'oreal Elvive range but recently, they've came out with their L'Oreal Paris Elvive Extraordinary Clay range which is made specifically for oily roots and dry ends, hurrah! Here's how I got on with the range everyone's talking about. The first product you use is the Extraordinary Clay Masque Pre-Shampoo Treatment, which is basically a clay mask for your hair. I'm a big fan of clay masks for my face but I wasn't all that sure how it would work for the hair, given how hard it is to remove the face mask versions! The idea behind this is basically to help absorb any excess oils from the scalp to make your hair feel much lighter and clean. For a clay mask, I find the texture much lighter than I had imagined. You apply it all over your scalp, wait 5 minutes and rinse off. Thankfully it is actually pretty easy to wash out and I definitely noticed a difference in the feel of my hair. As a weekly treatment for oily hair, it's wonderful. Once the pre-shampoo treatment has washed out, you follow on with the Extraordinary Clay Re-Balancing Shampoo. There are actually two kinds of shampoos in this range (one for anti-dandruff) but I felt the Re-Balancing range suited me best. Much like the hair mask, I thought this shampoo would feel really heavy on the hair and difficult to rinse out but I was proven wrong yet again. I found it to be easy to rinse out, with the right kind of texture to make a difference but not leave any residue behind. My hair was clarified but not stripped of the oils it needs. The Extraordinary Clay Re-Balancing Conditioner is the last step of the process. I find again, this is a product which is really easy to work with. I worried that all the clay elements would completely strip my hair but the conditioner really helps to bring back any moisture that may have been lost in that process. As for the claim of 72 hours of pure roots and hydrated ends, I think with time that could be possible. However, I still feel that my hair needs washed at minimum every 2 days since using this range. For some that may sound disappointing but for me as someone who absolutely needs to wash their hair every day, it's a great improvement. If you have oily hair or you're looking for something new to try, definitely give the range a try. Plus just now you can get all three for £10 from Boots at the moment!